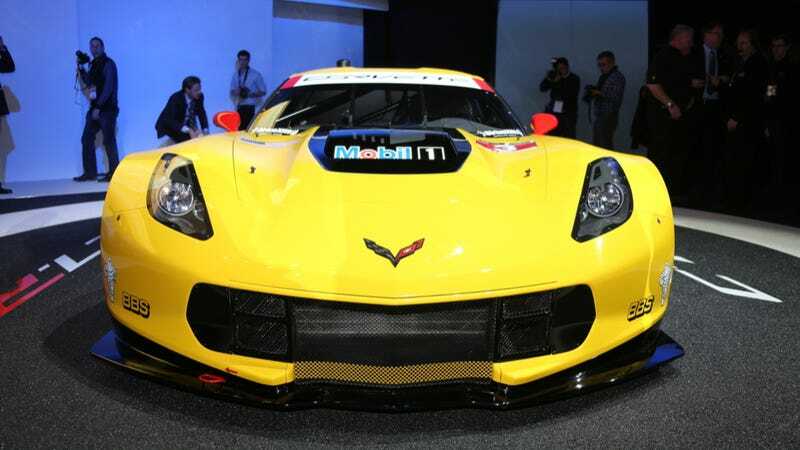 Along with the debut of the 2015 Corvette Z06 comes the debut of a new Corvette race car. The new C7.R promises to take up where the last Vette left off, and that's beating up on every other manufacturer in sports car racing. This year in the freshly united... uhhh... Tudor United Sports Car Championship, or TUSCC, the new C7.R will take on the likes of the Porsche 911, SRT Viper GTS.R, BMW Z4 GTE, among others when it hits the track at Daytona in just a few weeks. Adhering to the sports car rules, it has a 5.5 liter version of the Corvette's V8 and is wide as the dickens (yes, a technical term that I use often). It was closely developed with the Z06, and has a lot of the same lineage, namely the aluminum frame and many of the aero mods. Chevrolet says that the race team barely needed to modify the car in order to get the aero changes they needed to make it perfect for racing. That's impressive. There should be a paddle shift trans, the same unique radar based blind spot warning system, and a sound that is likely to make people who can hear go deaf and make people who are deaf hear. We'll see it on track in just a few weeks at the 24 Hours of Daytona.